Even indoor-only cats get out sometimes, and the likelihood goes up in the summer when there are fireworks, thunderstorms, and more people coming and going from your home. Here are a few important steps you can take to decrease your cat’s chances of getting out, getting lost, and getting injured. Close Windows: Don’t leave windows open when you go out, even if you have window screens. Double Check for Escape Holes: Check for torn screens. Your cat might love to sit in front of an open window, but first make sure the screen is intact. Even so, you still need to be careful. Cats can easily press against a screen and pop it open. Lock Up on the Fourth: Lock cat/dog doors when fireworks or thunderstorms are expected. Not only could your kitty bolt when startled by the loud booms, but another cat (or dog) could bolt IN! Make Inside Fun: If you’re worried that your cat is getting bored or sedentary in their indoor-only environment, there’s plenty you can do to keep them entertained and engaged. Find out why you should provide environmental enrichment for your cat, and how you can easily do so. Get a Collar: In addition to a microchip, give your cat a collar and up-to-date ID tag. Ideally, use a break-away collar to avoid the risk of accidental strangulation. 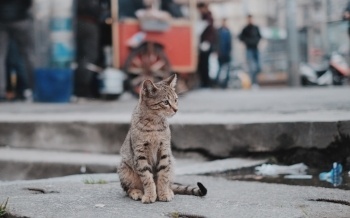 A collar not only provides a second way for other people to return your cat to you, but it indicates to the world that your cat has a home and is not a stray or feral. Teach Your Cat: Train your cat not to “door dart.” Yes, you can train a cat to come, stay, sit, and just about anything else you want... including “go to mat” to help prevent door darting. Watch Out for Guests: Let guests know that your cat is indoor-only. Visitors might inadvertently leave open a door or linger in open doorways long enough for your cat to escape. 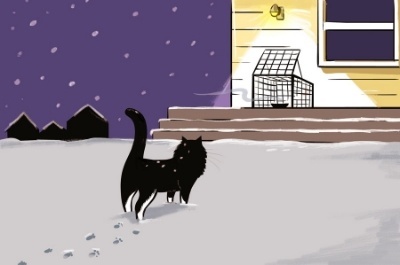 If you have an outdoor cat, there is unfortunately less you can do to prevent them from running away. As mentioned above, loud noises and a host of other factors can cause your cat to flee for safety. Your best bet is to keep your cat indoors, particularly when there are events that could cause them to run away, like 4th of July fireworks. Regardless, all outdoor cats should always be outfitted with a collar and legible and up-to-date ID tags. And, of course, they should all be microchipped, too. These steps will help to increase the chances that you and your outdoor cat will be reunited should they ever run off or be injured during their outdoor adventures. Do a thorough search of your home, garage, and surrounding “out buildings” (shed, pool house, etc.). Don’t forget to look carefully in closets, cabinets, your attic and basement, and even your clothes dryer. Carry a bag of yummy cat treats with you, shaking it and calling their name while you look. Take your bag of cat treats or some warmed up tuna outside with you and call their name. Your cat might be lurking nearby, even if you can’t see them. Contact your microchip and/or tag company to let them know your cat is missing. Contact all veterinary clinics, hospitals, and animal ERs in your area. Contact local animal shelters and monitor their websites (many shelters will update their website with found pets). Call and check their website every day, but be patient. They may be overloaded with “lost pet” inquiries as well as other pets in need of care. Ask your friends and neighbors to keep an eye out for your missing cat around the neighborhood. 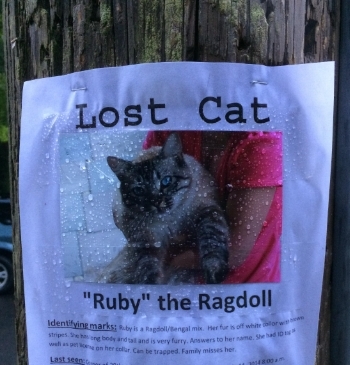 Plaster your neighborhood and town with “Lost Pet” posters. Focus on high-traffic areas like cafés. It’s a sad fact, but some people may try to use your lost cat as way to siphon a few dollars out of you. To keep yourself from becoming a victim or being distracted from the search for your cat, consider how to verify that someone really has your cat before proceeding. For instance, are there any unique features that aren’t visible in your poster? Even easier, ask the person to send a photo of your cat. With so many smartphones and other camera devices available today, this should be a straightforward request to verify whether someone actually has your cat. In general, be wary of someone who demands reward money up front and avoid wiring money before getting your cat back. If you don’t find your cat in the first couple of days, or even weeks, don’t abandon the search.